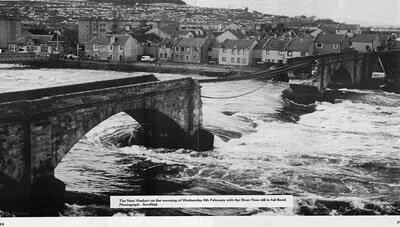 This vital link between Inverness and the 231 miles of railway north thereof was severed when on the morning of Wednesday 8th Feb floodwaters destroyed the Ness Viaduct. Originally built in December 1861, Miss Mitchell the daughter of the engineer Joseph Mitchell of Inverness and the Ross-shire Railway Co. laid the keystone of the viaduct, the next day the railway as far as Dingwall was opened by Colonel Yolland. Scotrail Photograph was in the Newspaper and an assurance the viaduct would be built to bridge the 400feet gap across the Ness river. The original structure cost £13,500 to build and was a ‘B’ listed structure and at first it was reported as possibly too expensive to build a replacement bridge. However the Scottish Office Historic Buildings and Monuments, Mr Gavin Burns, acting Regional Civil Engineer for Scotrail said “ The new single track viaduct gap was likely to have three spans with concrete piers supporting a steel superstructure with a concrete deck. We are examing the possibility of using the existing abutments for the new bridge. Consideration is being given to building the bridge to carry freight trains as well as the Super Sprinters which will operate on the far North and Kyle Lines” “The aim is to have the new bridge open to traffic by the middle of May 1990 next year” he added. It is understood that an agreement to construct the viaduct to carry freight has been made in principle, however formal spending consent has not yet been obtained. Until its collapse the old bridge carried 50,000 tones of freight a year. A major factor could be the proposal to use Dounreay as a national nuclear- waste repository. The decision was expected fairly, as it was likely that 15 trains per week would travel to Dounreay with Waste material. One local suggested that this would persuade the people of Ardgay and Lairg that perhaps the building of a Dornoch Firth crossing would be a good idea ! Following the Inverness incident divers have been carrying out tests on the other north viaduct those at Evanton and Alness were given a clean bill of health. The Connon viaduct south of Dingwall has been closed after flaws were found; it is expected to be repaired by mid May. This has of course not caused too many problems as the viaduct is situated on the section of line being operated from Dingwall with a replacement bus service between there and Inverness. The recent building of road bridges across the Beauly and Cromarty Firth part of the A9 upgrade, this resulted in a much shorter road journey to Dingwall and therefore the use of buses had made little difference to the overall journey time. Scotrail are going to great Lengths to ensure the service to the North, locomotives and coaches sets stranded are being serviced in the open in Dingwall, but a temporary depot is being built at Muir of Ord. Was delayed due to a faulty wheel, and arrived the following week, and special ramps had been constructed in the car park at Inverness station, and then to Invergordon to allow rail vehicles to be driven straight onto the track. The Class 156 Sprinters had been tested they went into service on the existing timetable. Two units went to Wick and Thurso for driver training. The new four- trains a day timetable which reduced journey times of up to 30 minutes were introduced. The Kyle Line services remained locomotive hauled until two new Sprinters could be moved by road. The cost of all the moves and providing the facilities was thought to be in the region of about £2 million. Scotrail had taken out numerous adverts in the local press stating their commitment to the North of Scotland Highland Lines, and sent letters household in Caithness and the Highland area, giving full details of their plans plus some deals with regard to Highland Railcard. Within the few months a further letter was sent to the entire household informing the inhabitants of the new timetables. The publicity caused by firstly the removal of the old bridge material and the introction of the Sprinter Trains was a great success and made the people in the north very aware of the new services. All this work was completed and opened on 9th May 1990, just over one year after the collapse, the new bridge measured 669ft long (203.9m) and was some 40ft (12.2m) from the River bed.